Do you find yourself checking your breath frequently and trying to figure out why it isn't fresh? Does your breath start to smell bad within minutes of cleaning your teeth? It's possible there's something happening under the surface that needs an exam by a dentist in Pearland, TX. In case you've got chronic bad breath, then keep reading to find out more about what may be causing it, how you can treat it, and how you can prevent it. Halitosis is the scientific term for bad breath. This dental problem can affect anybody for an assortment of reasons. It's estimated that at one point or another, at least half of Americans have halitosis. Although it could damage your confidence to be worried about your breath, it's usually simple to correct. Most instances of bad breath are brought on by tartar and plaque buildup on the teeth. The bacteria from the buildup causes an odor that can smell like rotten eggs. YOU HAVE A DRY MOUTH: Some medicines can lead to bad breath from dry mouth. If your medicine makes your mouth dry, make sure you help to keep it moist with mouthwash and water. EATING SPICY FOODS: Some foods, like garlic, onion, and spices, may result in foul breath. This is temporary, not something to worry about, and will normally go away by itself after your brush your teeth. BACTERIA AND BUILDUP: A common cause of halitosis is germs from debris getting caught in your mouth. If the buildup isn't cleaned daily, it starts to create a bad odor. USING TOBACCO: Tobacco is proven to create a bad odor. People who smoke or use tobacco products are also more likely to have gum disease, which is a cause of halitosis. In case you've got terrible breath that isn't getting better after improving your dental hygiene and habits, then you might want to schedule a consultation with a dentist. Everyday modifications, such as cleaning more frequently, flossing every day, and drinking a lot of water ought to correct your bad breath. If it doesn't, it may be a sign that something serious is happening. 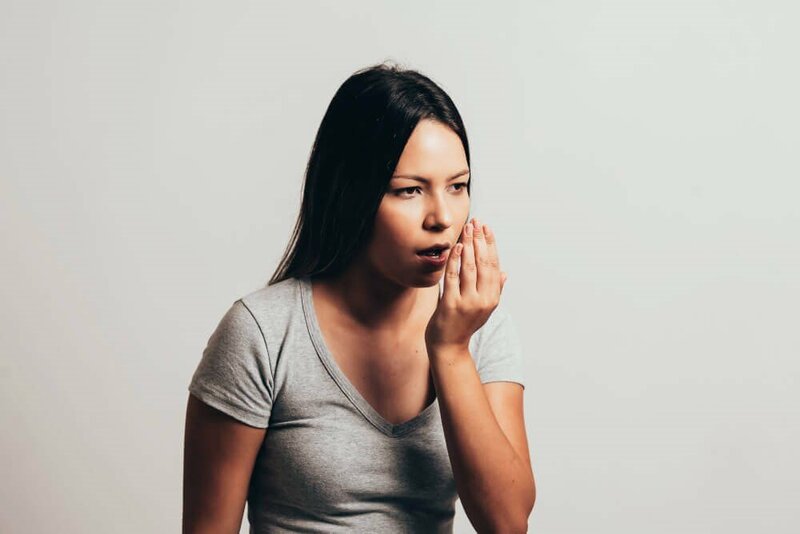 If a dentist feels like your halitosis isn't brought on by a dental issue, they might recommend seeing a primary care doctor in Pearland, TX for answers. Typically, bad breath is easily treated by an experienced dentist in Pearland, TX. In certain scenarios, it could be a sign that something bigger is happening, for example tooth decay, gum disease, diabetes, or a kidney disorder. In your consultation to talk about halitosis, you will probably get a thorough oral exam, with x-rays. Your dentist will inquire about your health history to ascertain the reason for your halitosis. The consultation will probably end with in-depth instructions on taking care of your mouth to avoid tartar buildup and improve your breath. The first and simplest option to get rid of bad breath, avoid cavities, and also reduce your chance of periodontal disease, is to always have good oral hygiene. If this doesn't stop your breath concerns, additional treatment may be required, based on the reason. For causes linked to dental health, your dentist may work with you, providing products and tips that will help you address the issue. This might include specific toothpastes and mouthwash. In case your bad breath is the result of a buildup of bacteria and plaque on your teeth, then your dentist might suggest a deep cleaning plus the daily use of an antibacterial mouthwash and toothpaste. This will kill germs and stop it from turning into buildup. If your halitosis is caused by gingivitis, your dentist may suggest an advanced treatment. Periodontal (gum) disease is a progressive problem that could result in receding gums as well as bone and tooth loss. SRP (scaling and root planing) therapy together with oral antibiotics can save you from additional damage while improving your breath. There's numerous approaches to help you avoid halitosis, tartar buildup, as well as periodontal disease. The easiest of which would be to brush at least two times per day. More frequently when you eat sugary foods that may become stuck in your teeth. Have a toothbrush at your workplace or in your handbag. A toothpaste using an antibacterial agent has been proven to decrease and protect against halitosis. Another very simple trick is to floss at least one time daily. Flossing removes food particles and plaque from areas you can't see, to stop bacteria from forming in your mouth. Cleaning your tongue may also decrease bad breath since it may harbor bacteria, particularly in people who have chronic dry mouth or use tobacco products. Try to keep your mouth hydrated during the day. Tap water is the ideal option since beverages like coffee and soda may result in a drier mouth. Chewing gum may stimulate saliva. Change your diet to limit foods, like garlic and onions that can cause bad breath. Finally, make certain to keep bi-annual cleanings at your dentist's practice in Pearland, TX to help keep your breath clean and your smile healthy. When you are worried about your bad breath, then speak with your dentist about potential reasons and treatment choices. At Highland Dental Care and Ortho., our staff performs dental examinations to identify and treat halitosis for our patients. We're pleased to help everybody in Pearland, TX so they can have better breath and a healthier mouth with proactive care in addition to restorative treatments. Speak to our office in Pearland, TX to schedule your appointment.